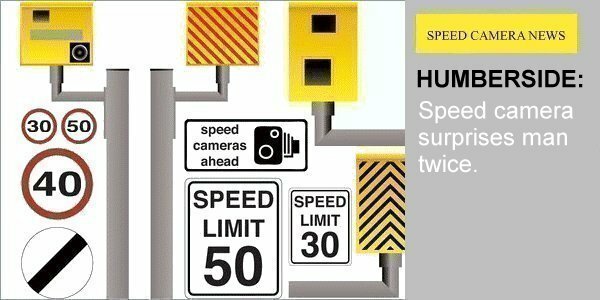 Dean Kenworthy, a 50 year old white van driver, got a shock when he realised that he was caught speeding at 57mph by a mobile speed camera. His van, which was leased, was limited by law to 50mph in 60mph speed zones - a fact that he claimed no knowledge of. Kenworthy already had 11 points on his licence and feared disqualification from driving. He expressed his surprise and disbelief in the universal way of raising both his hands in the air. His second surprise was that Humberside police captured an image of that precise moment - not having both hands on the wheel of a moving vehicle equates to failing to have proper control, a prosecutable offence. Kenworthy pleaded guilty to both speeding and failing to have proper control of the vehicle, but wasn't disqualified from driving as the court heard that would cause him exceptional hardship, essentially removing his means of earning a living. Three penalty points were added to his licence, he was fined £250, ordered to pay costs of £85 and a victim surcharge of £25. Wonder why there was a '£25 victim surcharge' ... who was a 'victim' in this case? Another cowboy whitevanman who needs taking off the road. If he doesn't know the speed limit, he's not fit to be on the road. He'll be just another of those who believe it's OK to hammer down the motorway at 80 because it's only a mile over the tolerance, so heavily loaded that his headlights on dipped beam are blinding everybody else. And he gets away with this for exceptional hardship. It would have been a very different report if he'd killed a poor innocent child, or a poor innocent father of five. He already had 11 points for goodness sake. Does that mean he's an innocent on the roads? This was a WRONG result. If it tastes good - it's fattening. Two of them are obesiting!! You and I and a zillion other road users are the victims of this maniac whose speedo was probably reading over the car speed limit anyway. You would have been going on blues and twos to the scene of his victim later that day. Isn't it simply payment into a fund for the benefit of victims of crime and stuff? I think all fines nowadays also get an addition of some amount for victim surcharge? Like value added tax? What value? The Victim Surcharge, introduced in April 2007, is an ancillary order imposed by a court. Following changes introduced on 1 October 2012, it is payable when an individual is sentenced to a conditional discharge, a fine, a community or a custodial sentence in relation to an offence committed on or after that date. Offenders under the age of 18 as well as adults will be ordered to pay the Victim Surcharge, although at lower levels than adults, to reflect the differences in sentencing principles between adults and juveniles. As all government and council services are now or appear to be self funding why do we pay taxes ? The court heard Mr Kenworthy, of Castleford, West Yorkshire, was given three penalty points for driving while using a mobile phone in March 2011. In June 2012, he was handed three points for speeding and last October he was given five points, again for speeding. In this case nobody was hurt or kiilled (by dumb luck) but this driver could now hurt or kill somebody by continuing to drive when he really should be banned. They didn't ban him becuase this would affect his income. Ah, Diddums! Another excellent example of the system showing more concern for the wrongdoer than for his victims (actual or potential). I wonder how the judge or magistrate who didn't ban him will feel if this joker kills somebody soon? In common with most civil servants (allegedly), he won't give a toss. That's not surprise and disbelief - it's firstly horror that he's been caught and secondly a complete set of asterisk words at the asterisks who caught him. What a good brief can do for you, innit? I wonder what speed limit zones he was in for the first two? I hope he has TomTom speed cameras! Did anyone wonder why the earlier magistrates gave him 5 points for the second speeding offence - took him to 11 points, surely even a dumbo can count from 11 to 12 and know that next time it's the footway, not the highway? Any parent knows that if you threaten a child with consequences, they HAVE to get the consequences if they breach the rules again, otherwise it falls into disrepute and they ignore you. Why did he only get three points this time if last one was worth five? He didn't even get the maximum fine (£1,000) this time! Painter and Decorator, £360 is a day's work for him.